Shaktiman, a snowy-white police horse, was greviously hurt during a protest march in Dehradun. Called a police officer, a soldier of the state, a re-presentation of Congress, the political party against which the march was called, eventually Shaktiman was just an innocent horse with no voice to say who actually hit her. This calls into question, once again, the poor state of our Prevention of Cruelty to Animals Act. Shaktiman died after a month of suffering. The Act remains unchanged. The price of torturing an animal remains Rupees 50, less than the cost of a cup of coffee. The word Shaktiman, Hindi for “strong one”, usually connotes a male. More specifically it stands for ‘one who embodies strength’. And it is also the name of India’s homegrown, pre-cable TV, male, flying superhero. It comes as something of a surprise then that a snowy white Kathiawari mare belonging to the police of Uttarakhand was christened Shaktiman. And it’s a twist of irony that this mare cleaved India in two, with the nation watching with equal diffidence and pain as she was attacked during a political protest, dying later, a martyr in a useless battle. On March 14 the BJP led a protest against the Congress in Dehradun. 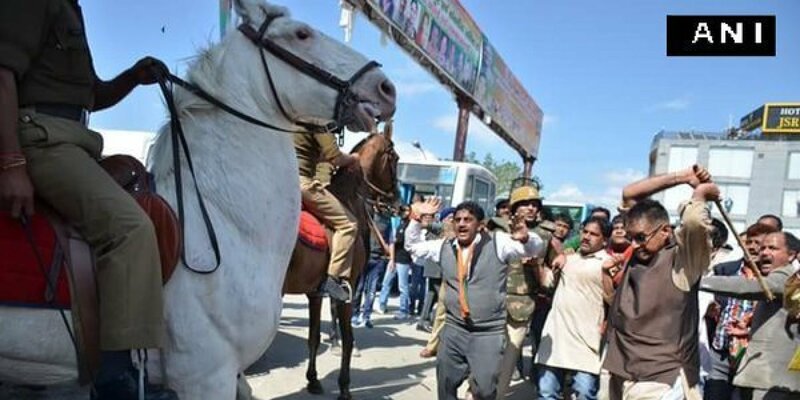 Shaktiman was used by the mounted police in Uttarakhand during the protest. In videos that emerged, BJP MLA Ganesh Joshi was seen violently brandishing and hurling a long, stout stick; he was with a group of equally agitated, shouting followers. One person pulled at Shaktiman’s reins, and Joshi was captured on camera making loud whacks on the ground with his stick. It is unclear if Joshi actually hit Shaktiman, but the usually placid mare, terrified, backed away from the violence, stumbled over a piece of metal and finally fell. Her fall is what the BJP did not see emerging as an outcome of their protest. As the gorgeous horse lay in a pool of blood, Shaktiman overnight became the vessel for anger against brute violence, a frustration at savage politicians who did not seem to care and, above all, symbolised the excruciating innocence of the gleaming white victim, now stained a sticky blood-red. “Brave”, “magnificent”, “fighter” were some of the words used for Shaktiman after her fall, which resulted in a broken leg that was later amputated and replaced with a prosthetic limb – a painful process lasting over a month. Arguably, if Shaktiman was a woman or a man, an attack on her would not have caused such a furore; people are tear-gassed, water-cannoned, lathi-charged by police during political protests throughout the country. Agitators, too, respond with violence — a stone thrown expertly in one part of India, a flaming torch speared like a missile in a caste agitation in another. What was so special about Shaktiman in a country with scores of horses, and countless cruelties toward its domestic animals? Most profoundly, Shaktiman was attacked because she was a symbol. As the one who carried a policeman, seen as an emblem of the then-ruling Congress party, the horse herself became an extension of the ruling state. In fact, having been carrying an officer as part of her duties, Shaktiman was as good as a police officer herself, as described by retired Indian Police Service officer Kiran Bedi. Contrast this with the fact that Shaktiman is actually a hapless, mute animal, who would suffer an attack or a beating, bleed and starve, but not actually be able to speak the name of her attacker. The irony that Shaktiman, seen as an active agent of the government, can neither utter a word of eloquence nor present a defence is rich and disturbing. It reminds us of a wide-eyed footsoldier taking a bullet for wars he has no hope of controlling or understanding. It shows us avarice in a naked form. Many citizens also saw this incident as a politically significant one. In a charged atmosphere, with BJP leaders talking continuously about proving one’s nationalism – by stating love for the “holy cow”, uttering “Bharat Mata ki jai” among others – the attack on Shaktiman was read as evidence of the hollowness of all the sanctimonious slogan shouting. “Was the horse anti-national?” asked many voices on social media. Would such an attack be tolerated if the horse was a cow, asked others. Significantly, Joshi offered no apologies for himself or his followers, stating he was not even “point one percent guilty.” Joshi’s lack of even a general apology led many others to ask if the BJP, ruling at the Centre, was getting too arrogant. The Congress took up the issue in the state assembly and the horse led to many sessions being disrupted. The BJP appeared to lose face for awhile, but then rebounded. Following a set of simultaneous political events, the Congress government was dissolved. Meanwhile, following her own tragic leg amputation, the spread of gangrene and infection Shaktiman died, a month after being endlessly feted by politicians, who posed for selfies with her, photogenically feeding her leaves for the camera. She had been fitted with a prosthetic leg which was flown in by a kind volunteer from the US. An assorted team of veterinarians and a handler named Ravindra Singh had been taking care of her. But in the end, what did Shaktiman’s death mean? A reading of Shaktiman’s fall as a symbol of the larger dystopia by right-wing elements among us is not a popular one. Yet, it is significant in that the incident symbolises several forms of hypocrisy. A party that talks constantly about saving the cow did not bat an eyelid when another equally innocent livestock animal was attacked. The BJP also accused the Congress of not giving the mare medical aid. The Congress too, did all it could to horse-trade: using this incident to bluntly attack the BJP with the splintered Uttarakhand assembly as its stage and arena. Those who care nothing for horses or even political horse-trading may still ask: What really is the big deal? It’s just a horse. Shaktiman will remain just a horse if we don’t use this incident to relook the awful state of animal-welfare affairs in India. Our dusty Prevention of Cruelty Towards Animals Act (1960) charges a person with a princely sum of 50 rupees for beating animals, that too only if the person is convicted. A cup of coffee is usually worth more. Horses with battalions and troops, whether for sport, racing or patrolling are looked after well while on the government’s roster. When in time for retirement after more than a decade of service, they are put down or sold off. If the latter, they are beaten and worked. We need to use the energy generated around Shaktiman to change our animal welfare Act. We need to change the way animals like bomb-sniffer dogs, camels in desert troops and horses used by mounted policemen – all of which provide invaluable services – are treated after their retirement. Some have remarked that Shaktiman is like Chetak, that great beast which was felled in an epic battle leading to the animal’s death but ensured its rider Maharana Pratap’s survival. The Shaktiman of today seems to be transforming into a gentle myth of tomorrow, but pearly Shaktiman did not want to be a martyr. She did not want to be a one-of-its-kind Indian horse with a uniquely foreign leg. Shaktiman wanted nothing but to live and to gallop. As a victim of dirty, violent politics that shows no signs of reform or change, the fall of Shaktiman seems to mirror our inevitable death of innocence.